And this is the confidence that we have toward him, that, if we ask anything according to his will, he hears us. And this is [how we can express] boldness in our relationship with God: Whatever we ask [of God, in prayer], so long as it is in harmony with His will for us, [we know] He hears our request. And this is the confidence that we have toward him, that if we ask any thing according to his will, he hears us. 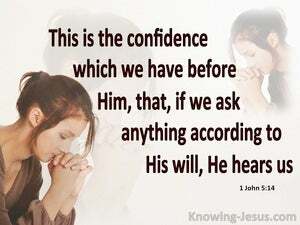 And this is the confidence which we have in him, that if we ask anything according to his will he hears us. 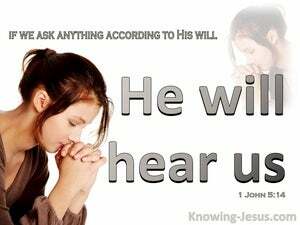 Besides, we have this confidence in him, that if we ask any thing according to his will, he will hear us. And this is the confidence which we have with him, that if we ask anything according to his will, he hearkens to us. And this is the assurance which we have toward him, that, if we may ask anything according to his will, he hears us. And we have confidence in him, that if we ask him for anything that is in accordance with his will, he will listen to us. And this is the confidence which we have in him, that if we ask any thing according to his will, he heareth us. And this is the confidence that we have before him: that if we ask anything according to his will, he hears us. And this is the confidence that we have in him: that if we ask ought, according to his will, he heareth us. Now the confidence which we have in him is this, that he listens to us whenever we ask anything that is in accordance with his will. And this is the confidence that we have before him: that whenever we ask anything according to his will, he hears us. And this is the confidence which we have in respect to him, that if we ask any thing according to his will he hears us. And, this, is the boldness which we have towards him: that, if, anything, we ask, according to his will, He doth hearken unto us. And this is the confidence that we have towards him, that whatsoever we ask according to his will, he heareth us. And this is the confidence with which we approach him, that whenever we ask anything that is in accordance with his will, he listens to us. And we have an assured confidence that whenever we ask anything in accordance with His will, He listens to us. And this is the confidence that we have in Him, that if we ask for anything that is in accordance with His will, He will listen to us. 13 These things have I written unto you that believe on the name of the Son of God; that ye may know that ye have eternal life, and that ye may believe on the name of the Son of God. 14 And this is the confidence that we have in him, that, if we ask any thing according to his will, he heareth us: 15 And if we know that he hear us, whatsoever we ask, we know that we have the petitions that we desired of him.